With all the health benefits of cranberries, sneaking this good-for-you fruit into your meals is a win-win situation. Fresh cranberries have a lot of pucker power so they work better in their sweetened and dried state especially when they can be re-plumped in the flavorful broth of a rice dish. 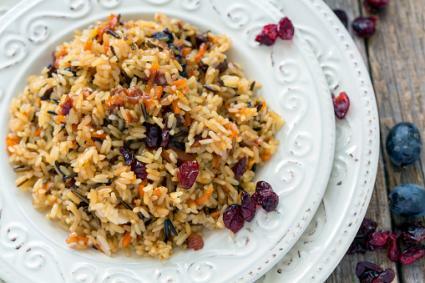 This dish gets a pop of flavor from the sweet and tangy dried cranberries and a little crunch from the wild rice and toasted walnuts. It's perfect anytime of year but especially around the fall and winter holidays. Best of all, it's so easy. Consider serving this as a side for turkey, chicken or pork or, when cooked and cooled, as a stuffing. Double the rice recipe so you can have leftovers to mix with leftover meat for a second-day dish that can be served as a warm main course or a cold rice salad. If serving cold, add a little extra-virgin olive oil or a vinaigrette of choice for moisture. To a 1 1/2-quart saucepan with a lid, add olive oil and heat over medium heat until the oil shimmers but is not smoking. Carefully add the drained white and wild rices, standing away from the pan so the wet rice doesn't spatter you with hot oil. Sauté the rice, stirring continuously, until a nutty fragrance arises and the individual grains are well coated with oil. Add the dried cranberries and hot chicken stock all at once, again being careful not to be spattered by hot oil. Raise the heat to high, stir and heat until the liquid comes to a boil. Turn the heat down to a simmer, cover and let cook for 20 to 25 minutes or until the liquid has been absorbed and the wild rice is tender. Remove from heat. Add the green onion and walnuts, fluffing with a fork until well mixed. Taste and adjust seasonings with salt and pepper. This recipe lends itself to several delicious variations. Use all white rice or all brown rice or a combination. If using all white rice, you will only need 2 cups hot chicken broth. If using brown rice only, you will need 3 cups hot chicken broth. If using a combination, 2 1/2 cups hot chicken broth, as in the original recipe, will suffice. Substitute toasted pecans, almonds or macadamias for the walnuts. Try using other chopped dried fruits like pears, apples, apricots, prunes, cherries or mango in place of the cranberries or in combination. Fresh apples and pears can be used but they must be cut into small pieces so they will cook to a tender-crisp state. Canned and drained mandarin oranges also are good candidates. Replace the chicken broth with vegetable broth for a vegan dish. For a meat dish, add raw peeled and deveined shrimp when you add the vegetable broth. Instead of green onions, use 1/2 cup caramelized onions. Add the zest from an orange, lemon, or lime and replace 1/4 cup of the broth with orange juice. Use basmati rice in place of white and wild rice and 2 cups hot broth instead of 2 1/2. Replace the dried cranberries with dark raisins and add 1 teaspoon of curry powder or to taste. Along with the green onion, add 1/2 cup sweetened dried coconut. Replace the walnuts with roasted peanuts. Sauté 1/2 cup chopped yellow onions in the olive oil until translucent and add all white rice, coating with the fat. Add 2 cups hot vegetable broth, 1 teaspoon paprika, 1 teaspoon cumin, and 1/2 teaspoon cayenne pepper. Replace the cranberries with dark raisins. Simmer for 15 to 20 minutes and stir in sliced almonds instead of chopped walnuts. There are so many rice varieties -- long grain, medium grain, short grain, brown, wild, jasmine, arborio, red, black -- and so many types of dried fruit that finding a winning combination for you and your family should be a very easy task. Experiment to your heart's content.